hehehe...that would be enough to make me twitchy too, if my entire house wasn't one big hole already! Good call on putting in the proper vent though, there's no time like the present! 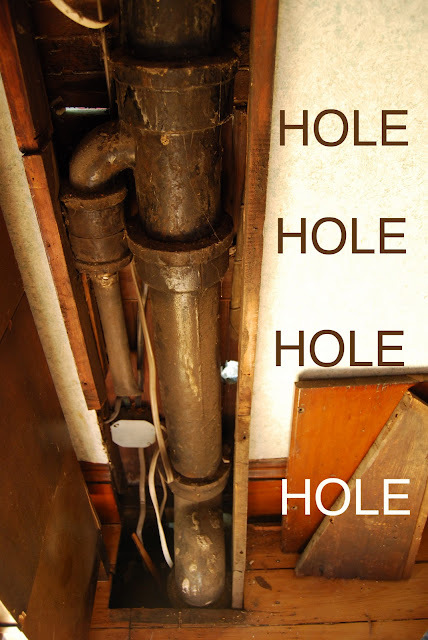 So is your blog going to be renamed Hole-y-oke Home? Heh. I'm upset with my husband because he's taking forever to fix our electricity *sigh* No holes in the wall, but I do have extension cords all over the place because half our outlets don't work. We have a hole in our bathroom ceiling because we thought the roof was leaking, only it wasn't the roof (after 3 roofer visits, and of course roofer work that didn't need to be done)...it's the chimney which involved a new bill, I mean person to come and fix it. 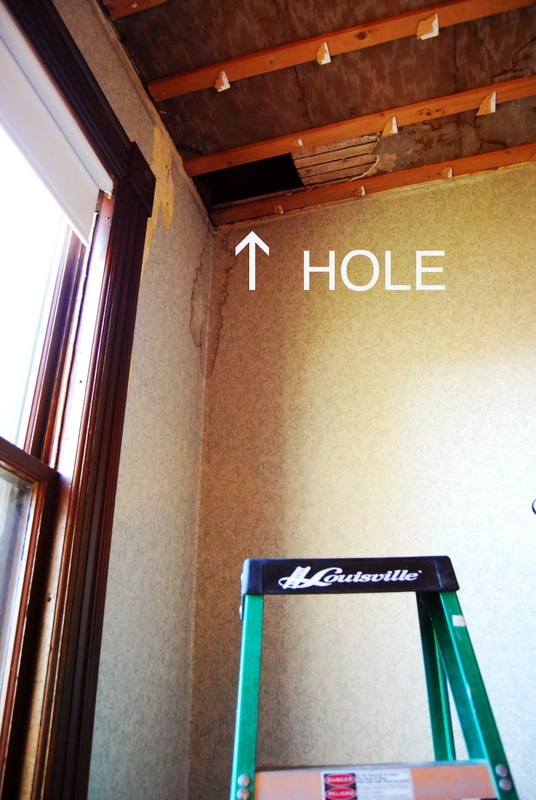 Now the ceiling needs repaired along with 2 other room ceilings..oh never mind! Wait until you have to start redoing the walls and have to mud and tape using joint compound. HEHEHE--You'll be walking around with a hammer knocking your brains out in 5 minute intervals....HEHEHEHEHEHEEEE! It's a labor of love with potential explosive gases and all. We here follow this blog because we love hearing all about it no matter how long it takes. 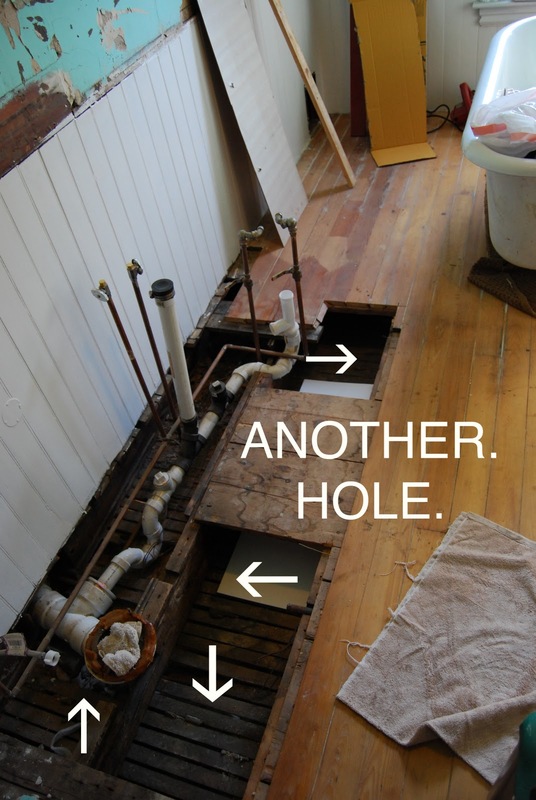 I love your blog and can totally relate to your reno twitches! We're working on my old family home and every time we do one thing something else comes up! Craziness. Here's to the completion of projects and the covering up of holes. Totally feel your pain, and your eye twitch! We are currently renovating our 80 year old house which is giving us many a twitch! How did your bathroom turn out? We are working on ours now and it looks like we have run into the same problems!